Sorry for how delicious these are. Sorry for how easy they are to make. Sorry for the mass appeal that they have. Sorry for how impossible they are to pass up, or eat only one of, or be tempted to get into a fist fight over the last one. 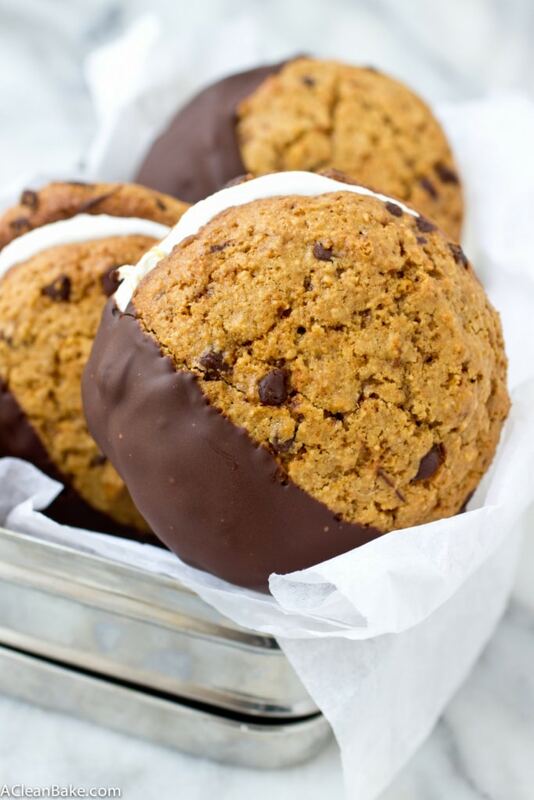 Sorry for the crisp chocolate chip cookies and for the soft, warm, pillowy marshmallow sandwiched between them. And most of all, sorry for the thick, crispy coating of rich dark chocolate that cracks and crumbles when you bite into it that, in any other scenario but summertime, makes a mess, but when it’s hot and you may or may not feel the grass between your toes, is a source of an immense amount of glee. My most profound apologies for that. 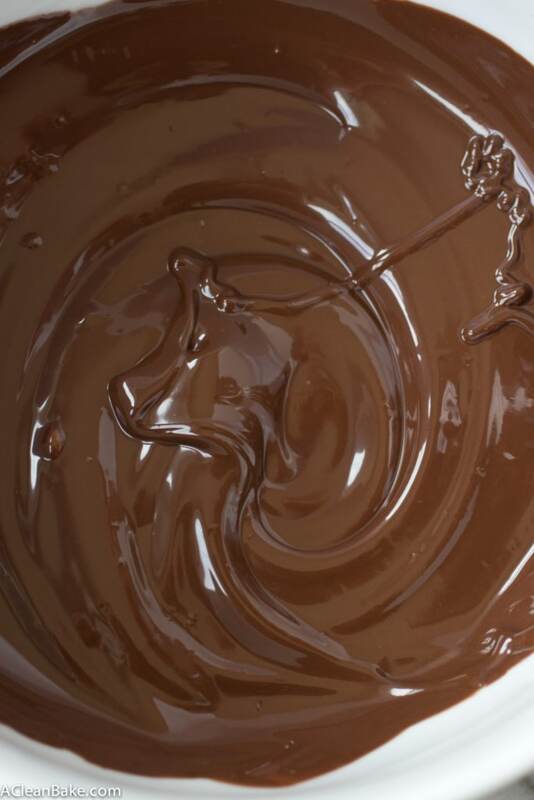 Ooh and sorry for all of the creamy, silky melted chocolate that will be left over after you’ve prepared the s’mores, which will demand to be swiped off the sides of the bowl one fingerfull at a time. Ok, well now that we have gotten that out of the way…how was your weekend? Did you camp? Did you build a bonfire? Did you toast marshmallows over said bonfire and make s’mores which you subsequently burned your tongue on a little bit (but it hurts so good)? Or, did you, as is my preference, skip the camping entirely and go straight for the s’mores? Orrrrr, do you just now regret how you actually spent your weekend, and really wish it had involved s’mores? Sadly, I spent half of the weekend working – I don’t talk about it much, but I do have a pretty demanding day job which I enjoy, for the most part, except when I have to spend my Saturday crunching numbers. Hey, at least I wasn’t camping (yes, I hate camping more than I hate working on a beautiful sunny summer Saturday, so now you know how much I hate camping). Luckily, I spent the other half in the best way possible: eating a delicious lunch with great friends and a staggeringly adorable baby. But after a full week-plus of work, I wasn’t in the mood to cook anything too elaborate (I was in charge of dessert), so I like to have desserts like this one in my back pocket. It feels elaborate, but is super easy, and can easily be prepped ahead of time. First, you have your cookies. I know I”m biased, but I really don’t think you can go wrong with my favorite grain free chocolate chip cookie recipe. For a flavor twist, try the ginger cherry version, or if you want a slightly healthier bent, this whole grain oatmeal version fits the bill. For true decadence, you might want to look into this double chocolate version – but we’re talking for expert level chocolate connoisseurs only. If you’re pressed for time, I beg of you, please don’t go buy a bag of cookies. Pleasepleaseplease. My favorite shortcut is Simple Mills chocolate chip cookies; yes it is technically a mix, but it is made of the same high quality ingredients that you’d mix together in your own kitchen (almond flour, coconut flour, arrowroot starch, coconut sugar, dairy-free chocolate chips, baking soda, and sea salt; you add eggs, vanilla and butter or oil), and none of the chemicals or preservatives that you would expect in a mix. After my own recipe, these are my favorite chocolate chip cookies. I should mention that they didn’t pay me to write this post or say any of this (although they do pay me to develop recipes for them on a regular basis). I am honestly a huge fan of the company and their products. So, in sum: lots of chocolate chip cookie recipes to choose from, but in a pinch, grab a box of Simple Mills mix. Next, you have your marshmallows. Whole Foods and other health food stores carry respectable marshmallows, which I used here, but in the past I have had success with this recipe if you want to try making your own. Finding a successful refined-sugar-free marshmallow recipe is tough. I have tried a few and they always turn out with a strange taste, consistency or both. If you have any recommendations for naturally-sweetened homemade marshmallows, please leave me a comment below! Finally, the chocolate. 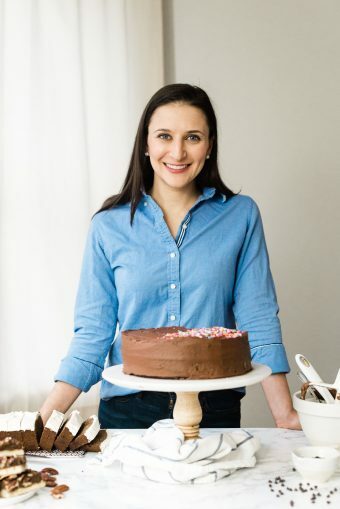 The easiest way to go is to melt a dark chocolate bar (or whatever potency you like best), but if you want to make you own, you can try this recipe – just know that you will have to keep these refrigerated because the homemade chocolate tends to melt easily in the summer heat. I think I am making these sound way too complicated and they’re not. The point I am trying to make is that you have tons of options to customize these to your preferences! If you make them, please send me a picture (acleanbake@gmail.com) or post them on social media with the hashtag #acleanbake, so I can see! I love seeing what you guys are making from the blog :). Bake the prepared cooke dough for 11-13 minutes (or, if using a different recipe, add about 2 minutes to the baking time) and transfer to a wire rack to cool completely. 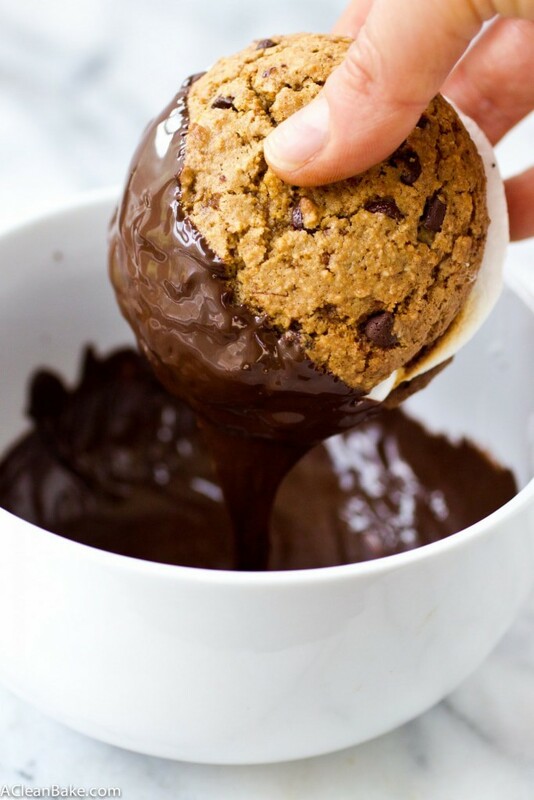 When the cookies are cool and feel “sturdy” to the touch, heat the marshmallows in a lightly greased pan, on the grill, or in the microwave until softened. Cover a large dinner plate of small cookie sheet with a piece of parchment or wax paper. Turn four of your eight cooled cookies upside down and place one large marshmallow or three small marshmallows on each of the upside down cookies, so that the marshmallow is laying on the flat side of the cookie. Sandwich another cookie on top (flat side toward the marshmallow, obviously) and put aside on the prepared plate or cookie sheet. Repeat with the remaining cookies to make a total of 4 cookie sandwiches. 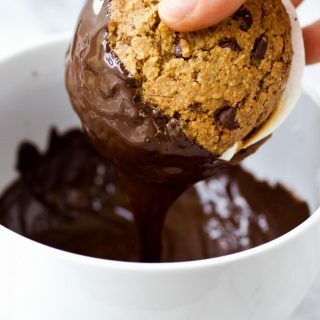 Place the plate in the refrigerator to chill the cookies while you slowly melt the chocolate in a double boiler or in the microwave in 30-second increments (stirring in between each). 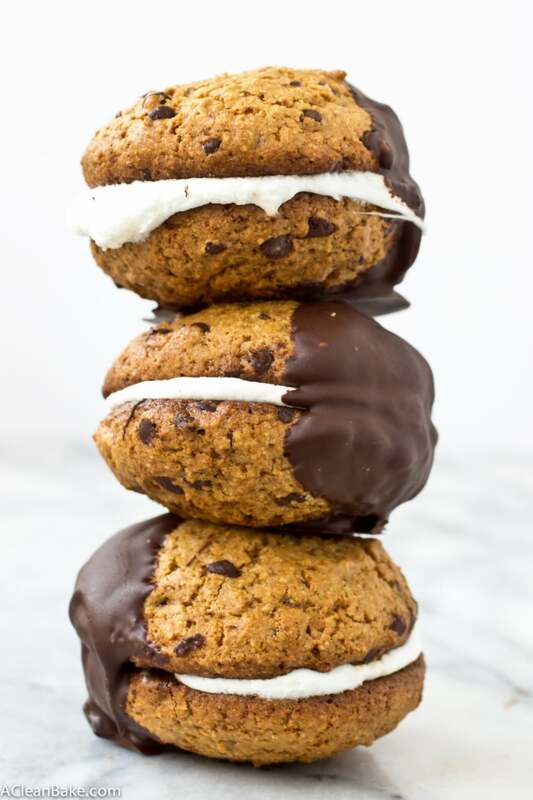 When the chocolate is melted and the marshmallows have chilled and solidified, dip each cookie sandwich into the chocolate, swirl it around a little bit to ensure a good coating of chocolate, and gently shake to remove the excess chocolate and then place back on the plate or cookie sheet. Repeat with the remaining cookies, then place the plate or cookie sheet in the fridge to chill until the chocolate is hardened. Serve immediately. These cookie sandwiches are ample, to say the least. If you’d like smaller portions, simply use 1 Tablespoon portions of dough, reduce the baking time to 8-10 minutes and use 1-2 mini marshmallows per sandwich. The cookies and marshmallows can be prepared 1-2 days ahead of time if necessary. The s'mores are best enjoyed immediately after assembly, but if you need to store them, do so in an airtight container at room temperature (in the fridge if it is very warm) for up to 5 days, and in the freezer for up to 3 months. Please note: This recipe was tested both with from-scratch and from-mix cookies, and photographed using Simple Mills’s chocolate chip cookies. The mix was provided to me by the brand, but this is not a sponsored post. I just thought you’d love this recipe as much as I (and my taste testers) did! You can see the original recipe on the brand’s blog here. I pinned these as soon as I saw them! These s’mores are so next level with the chocolate chip cookies! Thank you so much for sharing them! I hope you get to try them soon! Oh, perfect! I hope you enjoy them! You DID?! Dangit. I really though I had something original happening here (ok, who am I kidding, nothing is original anymore). Can we pretend I invented it though? That’s cool with you right? What about if I bribe you with s’mores…. No camping required OF COURSE. You are the best. The end. Nora, I love this idea! I can’t even tell you the last time I wore a swimsuit, so I guess these Chocolate Chip Cookie S’mores are safe with me! 🙂 Thanks for the recipe! On my way to make it ! Holy moly these look absolutely incredible darlin! Omgggg this is the best idea ever!!!! I absolutely love these – and they are GORGEOUS to boot! These look amazing!!! Also, I am glad I’m not the only one who HATES camping. Thanks! And no you are definitely not alone!